(Honolulu) Twenty-three people on a Lava Ocean Tours vessel were hurt shortly after 6 a.m. when what has been described as a “lava bomb” sent molten lava showering down on the metal roof of the vessel, leaving a significant hole in it. The Hawai‘i County Fire Department reports four people were transported by medics to the Hilo Medical Center by ambulance, nine others went to the hospital in private vehicles and ten people were treated on the scene for minor soft tissue injuries and burns. The most serious injury was a traumatic leg injury suffered by a 20-year old woman. All other passengers who went to the hospital were treated for minor scrapes and burns. 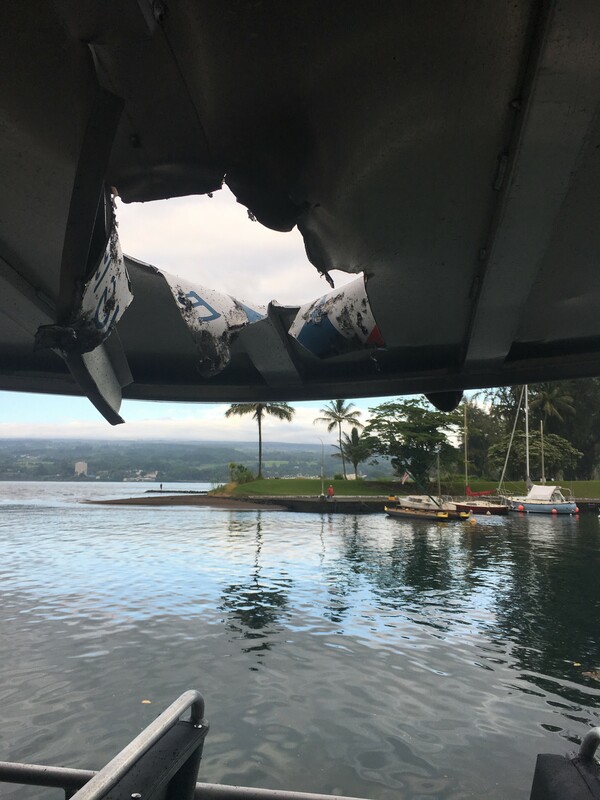 After the explosion, the boat returned to its dock at the Wailoa Small Boat Harbor in Hilo, where it was met by emergency medical personnel, first responders and officers from the DLNR Division of Conservation and Resources Enforcement. DOCARE and the U.S. Coast Guard are investigating the incident and have no further comment on what happened until that probe is completed. Anyone conducting commercial ocean tours of the active ocean entry at Kapoho are required to have a commercial use permit from the DLNR Division of Boating and Ocean Recreation (DOBOR). The owner of the boat involved does have a current and valid permit. This tour company also has permission to use the Wailoa harbor as its base of operation, after voluntarily relocating from the Pohoiki boat ramp which is about ½ mile from the active ocean entry currently. Additionally the U.S. Coast Guard established a permanent safety zone surrounding the entry of lava from the Kilauea volcano on the southeast side of Hawai‘i island. The safety zone encompasses all waters extending 300 meters (984 feet) around all ocean-entry points. Another tour boat, operated by Hawaiian Lava Boat Tours, was off-shore when the explosion occurred. The video provided by Hawaiian Lava Boat Tours below shows a second explosion, a minute or so after the first one that damaged the Lava Ocean Tours vessel.